Rumah Sakit Universitas Gadjah Mada - RS UGM is a rapid sustainable growth state university hospital in Indonesia, based in Sleman Yogyakarta. The Hospital is registered at Jl Kabupaten Lingkar Utara, Kronggahan, Trihanggo, Gamping, Sleman 55291. RS UGM is owned by Gadjah Mada University (UGM), one of the largest state universities in Indonesia. 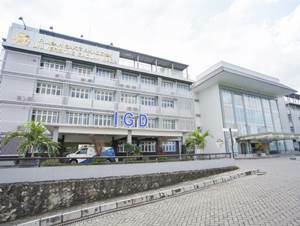 According to information found in the Hospital's website as cited by JobsCDC.com, RS UGM was first established in 2010 an initially registered as Hospital Akademik under The Rector Regulation No 69 / P / SK / HT / 2010 dated 4 January 2010. The name of Rumah Sakit Universitas Gadjah Mada officially launched in 2014 based on the Rector Regulation No 749/P/SK/HT/2014 dated 20 October 2014. Minimum GPA of 3.25 (S1) and 3.50 (profession). Have valid STR, willing to put SIP. Possess certification in ACLS, ATLS and have attended training in related field is preferred. Not tied to work with other institutions. Minimum 1 year of experience in General Hospital. GPA S1 and apt same as CPNS requirement. Possess certification in ICU/PICU/NICU/ICCU is preferred. Minimum 1 year of experience in ICU/Emergency Room/Inpatient or have certificate 6 months internship in ICU. Have valid STR or STRP. Possess competencies certification in nursing is preferred. Have experience in General Hospital is preferred. Active in English language is preferred. Willing to work in shift system and on Call. Possess competencies certification in Basic/Advanced Surgical Nursing/ATLS is preferred. Have internship experience in surgical is preferred. Minimum 1 year of experience in OK or Emergency Room Hospital is preferred. Mastering Microsoft Office and internet application. Have precision, numerical, verbal ability, social maturity and high emotional maturity. Mastering Office program (Word, Excel, Powerpoint, publisher, etc). Have a good analytical thinking and problem solving skills. Have a good skills in the field of statistics, analytical and data processing. Preferably have experience in the field of medical (hospital). Minimum 1 year of experience, preferably in General Hospital. Computer literate, mastering Graphic Design and MS Office applications. JobsCDC.com now available on android device. Download now on Google Play here. Please be aware of recruitment fraud. The entire stage of this selection process is free of charge. RS Universitas Gadjah Mada - Non CPNS Contract Staff RS UGM January 2018 will never ask for fees or upfront payments for any purposes during the recruitment process such as transportation and accommodation.